Venture Academy is a "mini Christian MBA" video training series based on the patterns, principles, and precepts of scripture. Topics covered include: sales, marketing, accounting, finance, business plan analysis, human resources, operations, legal, technology, business communications, and service management. Venture Academy is fully included at no additional cost for members of TRE. To learn more about Venture Academy, click here. Our staff has extensive experience in business and we have a passion to help support Christian business people with business issues. General support in business can also come from our online community where Christian business people are willing and able to support one another in business especially with other Christian business people within the same industry. Working together and sharing best practices strengthens our community. Members are invited to our events and workshops. These events are designed to inspire as well as train in everything from leadership to practical business applications. We are the host organization for the Chick-Fil-A Leadercast conference in the spring and we host a celebration evening in the fall for our members and invited guests. Check out the events page for more information on our next upcoming event. Our online community is designed to encourage open and regular communication between members and administration. As our community continues to grow the online community platform does a great job to help segment the global Christian business community into smaller relational communities so that support and communication can be experienced on a higher level. Lead generation is a key component to the success of any business. 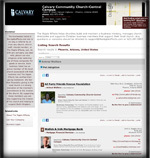 This powerful online directory is not only segmented by category and geographical location, but it is also segmented by church community. We understand that church members have the desire to support the business people that support their own church. We have a very distinct strategy in reaching the three markets that use the directory, TRE members, church members, and the non-church going consumers. One of the biggest keys to the success of our community is to have our TRE community support one another by using one another for the goods and services that we need. Frankly, the Christian business community does a lousy job at supporting one another. According to a study done by the Barnabas Group, the dollar is exchanged for goods or services around the Amish community an average of ten times and for the Jewish community seven times, Mormons four times and for the Christian community less than one time. Just imagine the impact to the Kingdom if we were to take some lessons from some of these other communities. Linking the member's websites to one another increases exposure to search engines. Individual company SEO efforts improve SEO for other members of the group. Linking member websites back to The Ripple Effects on key words improves consumer searches back to the business directory. Members will have the opportunity to join a local networking group to help them with presentation skills, creating cheerleaders for their business, and to generate referrals. The groups also focus on supporting the group members through bible study and prayer. REACH is THE key component of our mission and the reason we do what we do. By giving Christian business people the tools they need to help them be more intentional about their purpose in the workplace, we are equipping them to help their local church REACH more people for Christ and helping them to leverage their influence In the workplace. Each discipleship training session is approximately 6-9 weeks where members commit to daily personal devotions and weekly participation in group meetings. Example curriculum includes God in the Work Place by Henry and Richard Blackaby and 6 Ways To Glorify God and Serve Others Through Your Work, created by Center for Faith & Work, & The High Calling.